Buy Traffic Signs, Highway Signs, Street Signs, Roll-Up Construction Signs, Sign Stands, and Sign Posts online. 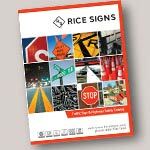 Rice Signs is a leading manufacturer of traffic signs and highway safety products. We sell to individuals, businesses, contractors, and to government agencies. Our easy to use web store offers hundreds of in-stock items including a full line of Federal and State compliant traffic signs, street name signs, roll-up signs, and custom signs. We have hundreds of additional traffic safety products beyond the scope of our website, so please call us if you do not see what you are looking for.